1953: Throughout the western half of Oklahoma, OK 3 ran along the same highways as it does today. At its western terminus at the Colorado State Line, the highway was duplexed with just U.S. 287, as U.S. 385 did not exist there yet. 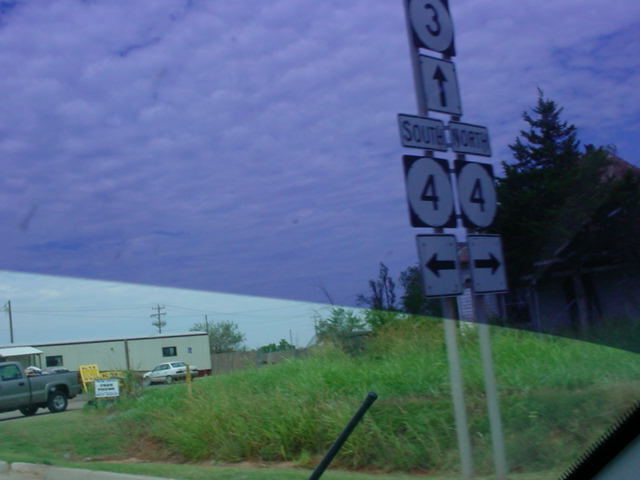 In Oklahoma City, OK 3 went south on May Ave. from the Northwest Expressway to S.W. 29th Street (U.S. 62/U.S. 277). It was duplexed with OK 74 throughout that stretch. At 29th, OK 3 went east. OK 74 broke off at Western Ave., U.S. 62 went north on Robinson Ave., and OK 3 continued east on S.W. 29th St where it remained for the rest of its time in Oklahoma City. OK 3W and OK 3E did not exist at this time. OK 3 ran along the present-day OK 3E route. Further down the road in Atoka, near today's eastern terminus of OK 7, OK 3 and OK 7 duplexed from U.S. 69/U.S. 75 to the Arkansas State Line. Instead of duplexing with U.S. 259 from Broken Bow to Idabel like it does today, OK 3 (and OK 7) went straight ahead, and multiplexed with U.S. 70 to Arkansas. OK 3 is the longest state highway in Oklahoma by far, and has to be one of the top three longest state highways in the country. Montana 200 may be the only highway that tops Oklahoma 3 for that award, as that highway goes east-west across the Big Sky Country. Almost all of OK 3 west of Oklahoma City is multiplexed with at least one other highway. Inside the Boise City traffic circle, OK 3 is part of a sexiplex. (Six highways on one road!) The other highways here are U.S. 56, U.S. 64, U.S. 287, U.S. 385, and U.S. 412. The only stretch west of Interstate 35 where it is not part of a multiplex is between U.S. 81 in Okarche and OK 74 in northwest Oklahoma City. OK 3 is named "Governor George Nigh's Northwest Passage" throughout its first 341 miles. (The highway between its western terminus and OK 74) The highway shares long stretches of road with U.S. 412 (186 miles) and U.S. 270 (140 miles). Most of the highway is two-lane with occasional passing lanes, which come in handy for passing any slow drivers on the road. OK 3 is duplexed with U.S. 412 throughout most of the panhandle. In the panhandle, OK 3 goes through Boise City, Guymon, and Hardesty. The first major town on the highway after leaving the panhandle is Woodward (pop. 11,853), which marks the eastern end of U.S. 412 and OK 3's duplex. OK 3 continues to be signed on the same road as U.S. 183 and U.S. 270. In Seiling, U.S. 183 leaves OK 3 and U.S. 270 but U.S. 281 joins in. Twenty-nine miles southeast of Seiling, OK 33 joins U.S. 270, U.S. 281, and OK 3, and this four-highway multiplex lasts for nine miles to Watonga. U.S. 270 and U.S. 281 head to the south in Watonga, but OK 3 and OK 33 continue their duplex for another 28 miles to Kingfisher, where OK 3 then leaves on U.S. 81. Thirteen miles later, U.S. 81 and OK 3 split, and for the first time since entering the state, OK 3 is all alone on a road. OK 3 now enters the Oklahoma City metropolitan area on the Northwest Expressway, a 6-lane divided highway with a 50 mph speed limit. It is one of Oklahoma City's most infamous roads, as traffic clogs the road during most hours of the day. At the Lake Hefner Parkway (OK 74), OK 3 heads south, and continues to head south after the southern end of OK 74 two miles to the south. OK 3 now duplexes with Interstate 44 and Interstate 240 throughout the rest of its time in Oklahoma City. The two highways converge into one OK 3 on the west side of Ada (pop. 15,691). The highway then becomes part of the Richardson loop, a freeway around the west side of the Ponotoc County seat. After a short multiplex with U.S. 377 and OK 99, OK 3 continues as a Super-2 highway to Stonewall. Northwest of Coalgate, OK 3 becomes duplexed with U.S. 75, and this lasts for 18 miles to Atoka. After leaving Atoka, OK 3 becomes more scenic, but it also becomes a faster route, as towns are few. The highway intersects the Indian Nation Turnpike, U.S. 271, and OK 2 in Antlers (pop. 2,552), the county seat of Pushmataha County. Between Antlers and Broken Bow (55 miles), OK 3 has intersections with OK 93, OK 98, and OK 147, all at those highways' northern termini. In Broken Bow, OK 3 heads south with U.S. 70 and U.S. 259 to Idabel, where the highway breaks off to the east. About 28 miles later, OK 3 finally leaves the state of Oklahoma and enters Arkansas, over 600 miles after it began at the Colorado State Line. U.S. 56/U.S. 64/U.S. 412 West/U.S. 287/U.S. 385 South/OK 3 East at U.S.
South. U.S. 385 is left off of this sign. Inside the traffic circle, this would be U.S.
56/U.S. 64/U.S. 412/OK 3 West/U.S. U.S. 56/U.S. 64/U.S. 412/OK 3 West/U.S. U.S. 56/U.S. 64/U.S. 412/OK 3 East/U.S. U.S. 64/U.S. 412/OK 3 West at OK 171.
assurance shields in western Texas County. OK 95 runs along this road for five miles. the north to bypass downtown Guymon. U.S. 412/OK 3 West/OK 136 North at U.S.
54 in Guymon. U.S. 54 is the cross street. Hardesty. OK 94 connects to U.S. 54/U.S. U.S. 270/U.S. 412/OK 3 East at U.S. 283. U.S. 270/U.S. 412/OK 3 East at OK 46. East at OK 15 West in Woodward. U.S.
OK 50 North. OK 50 connects to U.S.
64 north of Freedom at its other end. U.S. 270/OK 3 East at U.S. 60 East/U.S. U.S. 270/OK 3 East/U.S. 60 West/U.S. OK 33 continue straight ahead. U.S.
270 and U.S. 281 head to the south. OK 3 East at Kilpatrick Turnpike West. OK 3 East at Kilpatrick Turnpike East. the eastern end of the OK 3W/3E split. OK 3 West at Kerr Lab Rd. in Ada. U.S. 377/OK 99 North/OK 3 West at U.S.
OK 3 West at OK 48 north of Tupelo. near Sardis Lake at its other end. OK 3 West at U.S. 69/U.S. 75 in Atoka. southern OK 2 connects OK 3 to U.S.
OK 3 East at U.S. 271 South in Antlers. OK 3 West at OK 93 South in Rattan. skirts the eastern edge of Lake Hugo. on the ground at the time of this picture. at U.S. 70 East/OK 3 West in Broken Bow. shields are actually on the U.S. 70 bypass.